When using the editor to create a video, tip windows pop up along the side to help with each element. You can add music, upload your own images and sound files. I found that once I got started, the site was pretty intuitive to use. It took me about 90 minutes to create my first presentation video. Although I know I could spend much more time watching tutorials and learning the fine points, this does not seem like a bad first effort as a simple presentation. The only issue I have is that the site automatically chooses which screen will be the cover image. There are certainly many other potential uses for Wideo – some of them involving collaboration with students. For instance, students can work together to develop a Wideo during class time, using the free, downloadable storyboard tool. We know that technology availability varies from program to program, but that does not preclude the use of an online tool like this. If there is internet access during the session, the video can be created during class. If not, the catechist, or a team of older students working out side of class, could create the video and download it to a desktop (using a tool like the YouTube Downloader) for showing during class at a later time. HootSuite (http://hootsuite.com/) is a social media management tool. Although it was developed with businesses in mind, it certainly can be adapted to fit the needs of churches as well. If you are one of the pioneers in social media in your church and you are finding it just a little bit daunting to keep track of the Tweets, posts, blogs, shared photos and YouTube videos associated with your parish or congregation, HootSuite can help. I noticed that many prolific social media contributors were inserting links to a URL shortener with “ow.ly” in it, or the post itself came from @HootSuite. 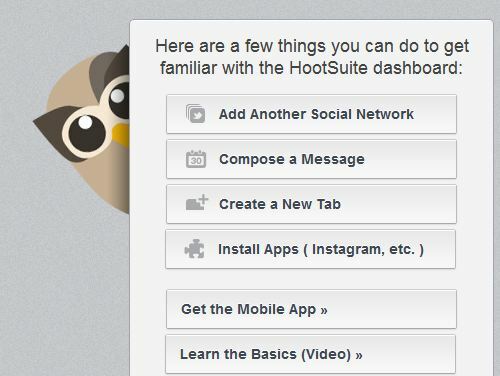 Curious, I investigated and spent last summer playing around with HootSuite, just getting used to the features. I have to say, it seems to be a great tool for ministry. In a single window, a free HootSuite account allows you to display up to five social network accounts (Facebook, Twitter, WordPress, etc.). In addition, you can have twenty tabs (a tab sorts your streams by content), and each tab can have up to ten streams (a stream can be a mention or a direct message, for example) for content as it is updated. Hey, I just wrote this and I’m already confused, so let me make this simple. Instead of logging in and out of your various social networks, they are all organized in your HootSuite account in one window, sorted by tabs. The beauty is that you can create one post and tell it to go to all or some of your social networks! For example, I created tabs for my personal Facebook account, my parish Facebook account, my personal Twitter account and a Facebook group for technology in ministry that I belong to. I can send out one post to all of those sites at once. I can also click through my tabs to read the latest content for all those social networks as it arrives without the bother of having to sign in and out of those different accounts. HootSuite is powerful and a bit complex, so give yourself time to learn the features and take advantage of its extensive help and tutorial menus. Some of the useful features I discovered include the ability to block or follow others, features for teams working in a HootSuite account, ow.ly, the built-in HootSuite URL shortener, and the Hootlet application, which allows you to post a link to any web site you happen to be visiting directly to your HootSuite network. The Hootlet applet can simply be dragged to your browser bookmark toolbar for easy access as you browse the web. HootSuite itself will save you time in your social networking ministry, and the Hootlet will amplify that savings! I would be interested in hearing what you think about HootSuite and how you think it compares to other social networking management tools. Leave a comment if you wish to share! It’s Independence Day in the USA and I can’t think of a better Web 2.0 tool to celebrate freedom than Dropbox! Freedom from multiple file versions! Freedom from thumb drives! Freedom from disorganization! Dropbox is an online storage and file sharing application that can help simplify your life is so many ways and give you the freedom to maximize your productivity on the computer, especially when sharing files with others. Start by creating a Dropbox (cloud-based) account at www.dropbox.com. It’s free and you receive 2 GB of storage just by joining. Be sure to also install the Dropbox Desktop Application. Any files you drag into the desktop application will be automatically synced with your cloud-based Dropbox account. If you install the app on any other device (iPad, your laptop, your iPhone, etc. ), all your files will be accessible to you from any of those devices, too. Once you have your folders and files in order in Dropbox, you can invite others to share the folders. For every person you invite and who installs Dropbox themselves, you will receive extra free storage. If you work in committees, Dropbox allows all the committee members to share the same central document, spreadsheet or PowerPoint presentation without having to email the files back and forth. If you need to send large movie or photo files to others and want to bypass the hassle of being bounced back by the email server because the attachment is too big, Dropbox can help. Large files take a few minutes to load, but then are readily available to others who share the folder in which they reside. Can’t find the minutes from the last church committee meeting? Put them in Dropbox and they will be there when you need them, accessible from any computer with Internet access. Dropbox accepts nearly every type of file format and no formatting changes are made to your files when they are in Dropbox: a Word document remains a Word document; an Excel spreadsheet remains an Excel Spreadsheet. Finally, Dropbox is not ad suported as many Web 2.0 tools are. They have such a great product, and the Dropbox creators hope people who find it useful will upgrade to a paid account. However, 2 GB of storage is plenty to play around with and give you a feel for whether Dropbox can solve your storage and collaboration needs before you need to make that decision. Whether you use Dropbox with students, parish committee members, or for your own personal use, it’s a great tool and one that every catechist and parish minister should have in their personal technology toolbox! If you use Dropbox, tell us how you find it helpful by adding a comment to this blog post.